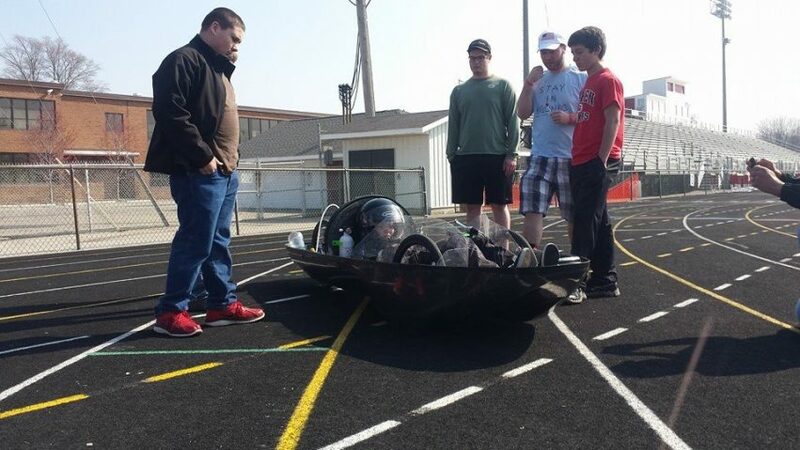 We are a group of students from Goshen High School in northern Indiana and for the past six years we’ve had the opportunity to design, build and test high mileage prototype vehicles in a class called Engineering Design and Development. Year to year this program serves about 30 students aged 15 to 18. We begin with little to no background in an automotive or engineering technology background, and through the course of this program learn many new skills. We compete in the Shell Eco-Marathon in Houston, Texas. Participants include students from high schools and universities across North and South America. There are two main categories of competition: Urban Concept and Prototype. Urban concept vehicles more closely resemble street legal vehicles while prototype vehicles are smaller and built primarily for fuel efficiency. Each main category has subcategories consisting of different engine types: gasoline, ethanol, diesel, hydrogen, or electric. This year Goshen High School entered two vehicles in the Prototype category: one gasoline, the other, diesel. The students’ entries: the top gasoline-powered, the bottom diesel. Over the past two years we’ve focused on monocoque design, in which the body and the chassis are one in the same allowing us to produce roomier yet lighter vehicles. This past year, we spent time during our summer modifying an existing plug to create a new body shape that gave us better aerodynamics, an increased turning radius and an easier composite layup experience. Once our school year started we dedicated a large portion of our time obtaining sponsorships to fund our program since we are funded 100% through donations from our individuals and corporations in our community. We sent our foam plug (cut three years ago by Global Composites) to one of our sponsors, Better Way Products/Jasper Plastics Solutions, who produced our mold. When we received our mold back we began laying up our first practice piece with fiberglass and balsa core. We then began prototyping new and existing ideas into the new body design. For our final piece we worked with carbon fiber generously donated by Zoltek. Throughout the course of the year we learned that carbon fiber is as difficult to work with as fiberglass, but sharper. The benefit is that carbon fiber is stronger and lighter, and helped us drop 40 pounds compared to the previous year’s body design. 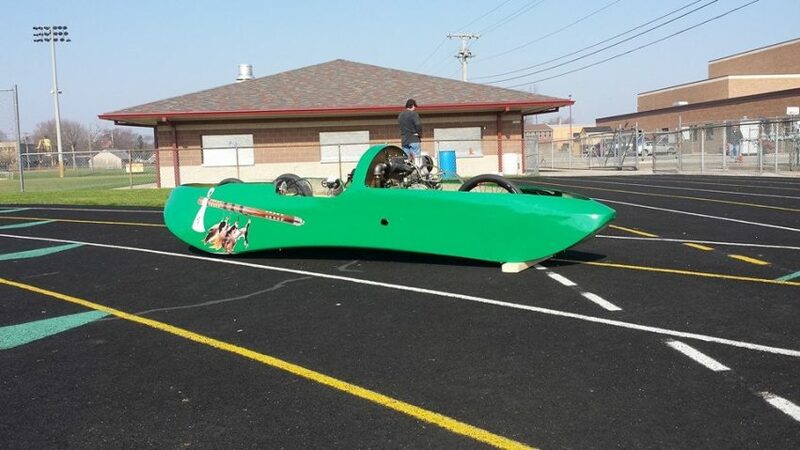 The diesel vehicle used a fiberglass monocoque body that we laid up and competed with last year. We simply made modifications to systems that required upgrading, and swapped out engines going from a small 35cc gasoline engine to 219cc diesel engine. One of the greater challenges we had with the transition from gas to diesel was fitting the much larger diesel engine into a compartment designed for a smaller engine. We overcame this challenge and succeeded in our first year competing in the prototype diesel category. For the gasoline vehicle we used the carbon fiber donated by Zoltek to make a brand new body with a new body shape, slightly modified from the previous year. Our goal for this vehicle was for it to be our lightest yet. 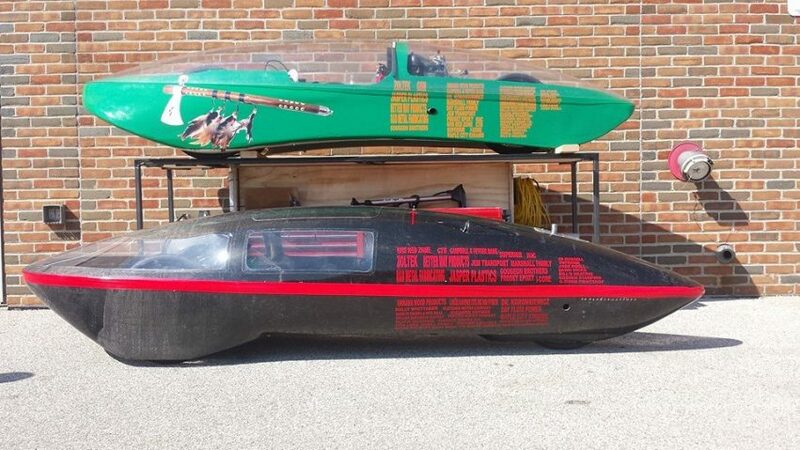 Our previous monocoque vehicle weighed in at 144lbs fully loaded with the exception of the driver. We have used composites before, but this was our first time using carbon fiber. With the carbon fiber we used a polyester resin for the top piece of the body, and thanks to a donation by Gougeon Brothers, Inc. we were able to use Pro-Set epoxy for our bottom piece. The Pro-Set epoxy gave us more time to lay up the carbon fiber, which was important for us while learning the lay-up process. This helped us get the balsa core, donated by I-Core Composites, positioned correctly for our monocoque design. Close up of the gas-powered vehicle. This past April, after a year of dedication it was time to see the fruits of our labor. 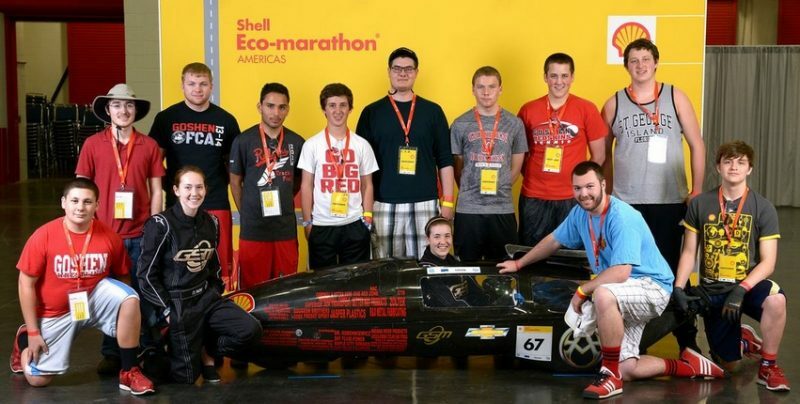 We took 13 students and two cars to Houston, Texas for the 2014 Shell Eco-Marathon. On our first day in Houston the diesel vehicle made it through technical inspection with little to no setbacks, proving its adherence to the rules but most importantly that its safety features were up to par. The gasoline vehicle, on the other hand, had a major setback when a weld broke on the steering system during the inspection. On day two of the contest, after some welding and reassembly, the gasoline vehicle made it through technical inspection flawlessly. It then went on to complete a full practice run of ten laps, while the diesel vehicle struggled to control the engine torque. We faced having to reinforce the drive train, which was difficult with limited materials and processes available. On the third day of the official contest runs began. The diesel engine continued to have issues and the vehicle did not complete a full set of ten laps. 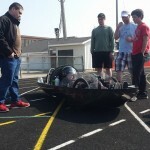 The gasoline vehicle completed two official runs with the first run resulting in the best mileage for our team, at 588.21 mpg. The night leading into the fourth and final day the EFI car’s team completed an engine swap from a 49cc electronic fuel injected engine to a 35cc carbureted engine. This vehicle then went on to complete one official run but did not obtain a higher fuel efficiency. The diesel vehicle completed an official run the last day of the contest with a fuel usage of 442 mpg giving the vehicle a fifth place finish out of nine competitors. 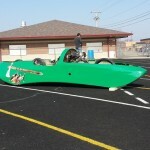 The now carburated gasoline vehicle finished in 17th place of 43. Of the 16 teams that finished above us only four were high schools. The students’ entries: the top gasoline powered, the bottom diesel. 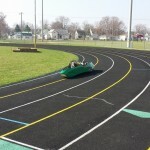 Rounding a curve on the race track. 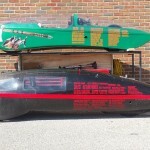 This entry was posted in Automotive, Composite Fabrication, Techniques & Tips and tagged #39, Epoxyworks #39, Fall 2014, Goshen High School, prototype vehicles on August 6, 2015 by ewadmin.